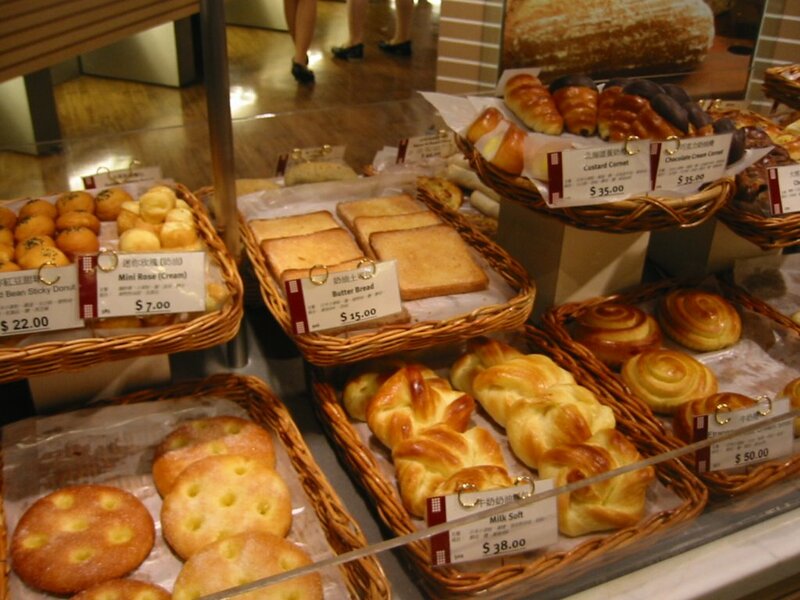 Pozzo is a bakery located next to the entrance of San Want hotel on the busy Chung Hsiao East Road shopping street. It's a great place to stop by for a snack or to pick up some bread for the next day. 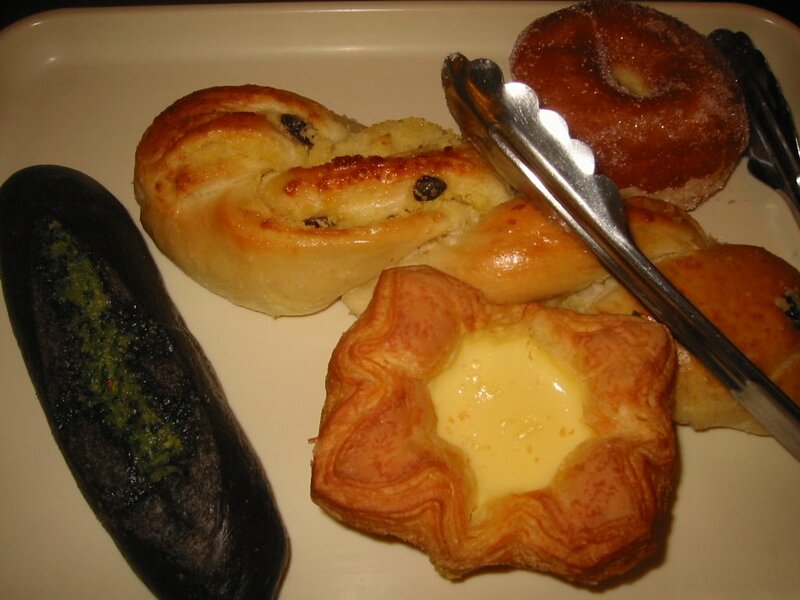 With a varying assortment of breads and pastries, today I chose to get (from left to right) squid ink garlic loaf, custard filled tart, coconut raisin bread, and a doughnut for under NT$150. Hey, I haven't had a doughnut in awhile! I wish I could have had hands free to take more pictures inside the shop (maybe next time! ), but it was brightly lit with wall to wall baked goods as well as customers. 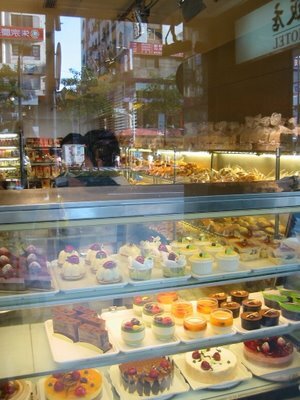 The front of the store near the window had the desserts with cakes, custards and tarts. The custard tart was huge and the milky filling reminded me of a softer egg tart filling. The garlic squid ink bread had little bit of garlic butter spread in top of the center and a pleasant garlic taste after you had finished eating the bread- though it's not garlic bread, but rather the flavor of garlic infused in the bread. I shared some with a friend, and he wanted to eat more. 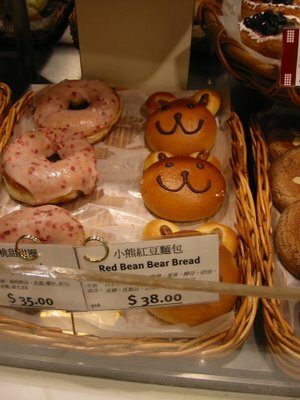 The doughnut was good- nothing out of the ordinary and nothing bad to say. I didn't eat the coconut raisin bread, but it disappeared quickly as well. The hours are pretty good for early and late birds, and the signs are all English and Chinese friendly. I would definitely go there again and try out some of the other offerings, and pick up some more garlic squid ink bread. 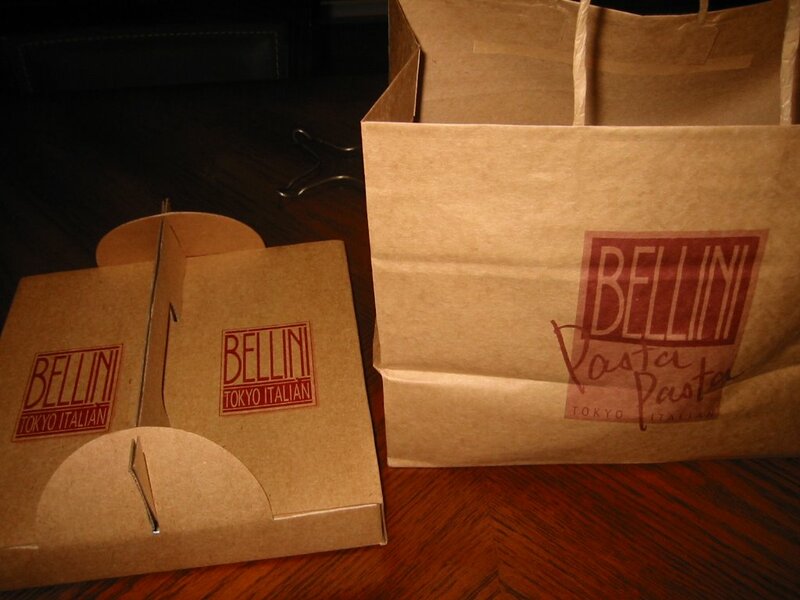 There's so much pasta, BELLINI PASTA PASTA has it twice in their name. With four locations in Taipei, Bellini Pasta Pasta features family style portions of salads, appetizers, pasta and desserts with friendly service and casual atmosphere. On this day, I felt like eating some bolognese spaghetti and was near the Warner Village. I placed an order to go and was offered a place to sit and some ice water as well. The server asks me if I want my pasta soft, and I say al dente. The inside of the Warner location features long wooden tables and benches, and view of the chefs cooking. It's smaller than I expected, so I can see why there would be a wait for a table on a busy Friday night. Luckily, it's before dinner time and a weeknight, so my pasta is made pretty quickly. 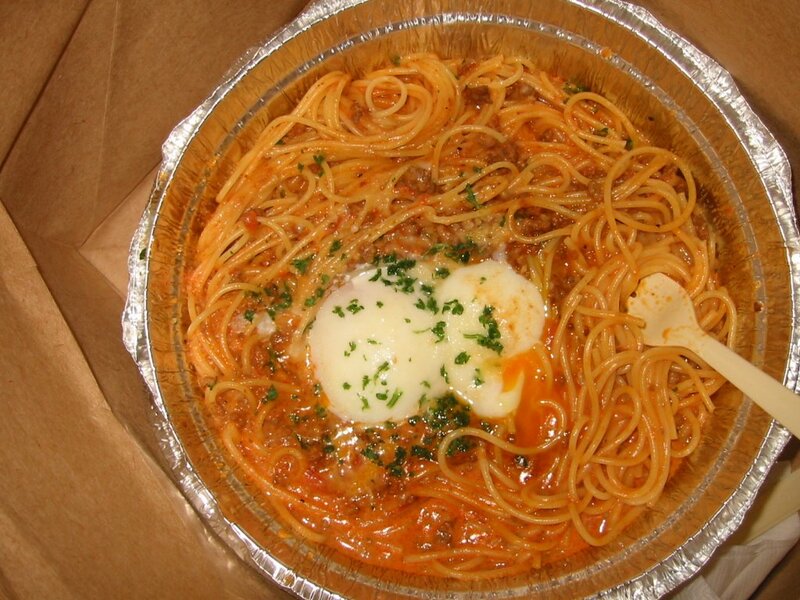 The Bolognese spaghetti ($390) here comes with two soft boiled eggs on top. 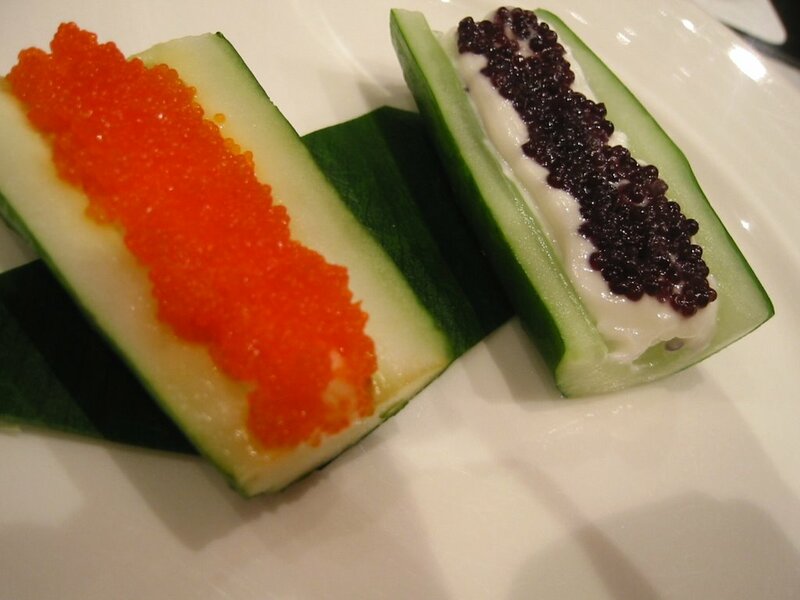 I've never seen this before elsewhere-so I don't know if this is an Italian thing, a Japanese thing or a specialty of Bellini's, but it's surprising combination that works. 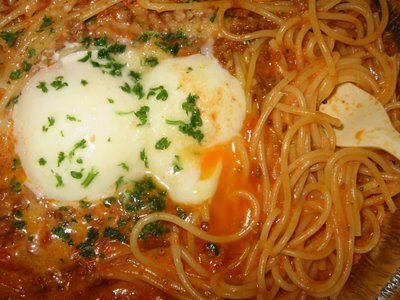 The tomato meat sauce is flavorful and slightly sweet and the soft boiled eggs cook a little more when mixed into the pasta. There's not a lot of meat, but enough sauce to cover all the spaghetti. I also thought that the meat sauce was perfectly flavored, where often I find Macaroni Grill's pasta to be on the salty side. The portion would easily be enough for 3-5 people, so you could order a few different pastas family style if you went with a group. I ordered it to-go and could not finish it. The leftovers heated up pretty well for a few days afterwards too. 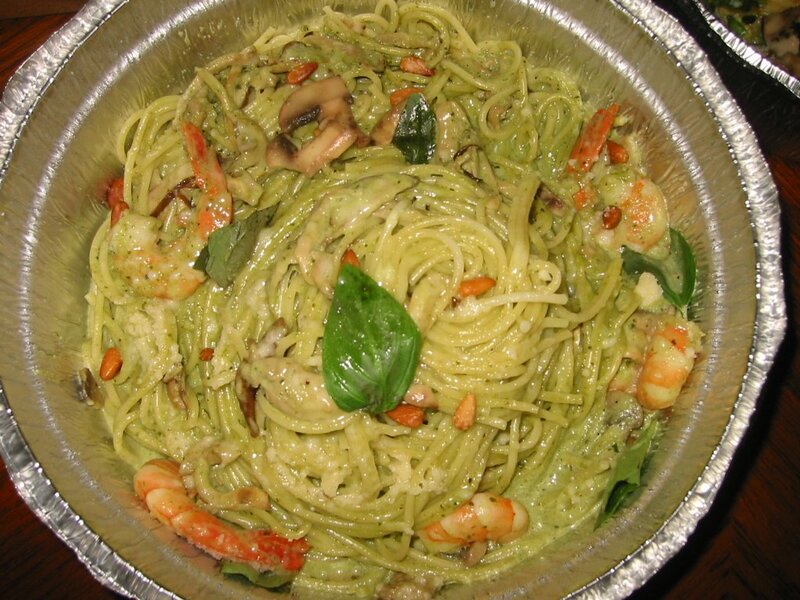 In the past, I've also enjoyed their Pesto Pasta with Shrimp and their Clam Linguine looks quite good. I'm not sure about their other locations, but the Warner location has a "show window" by their entrance, of their pastas captured in plastic model form to catch your eye. 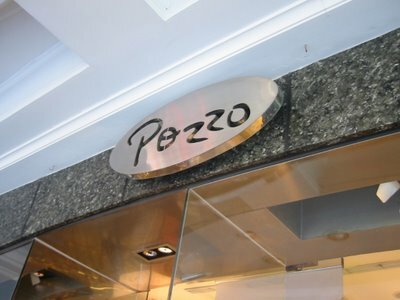 Their menu is in English and Chinese and features a lot of the pasta names in Italian. Their business card has "Bellini Tokyo" on it, so I know they have locations in Japan, but I'm not sure if that is where the chain originates. 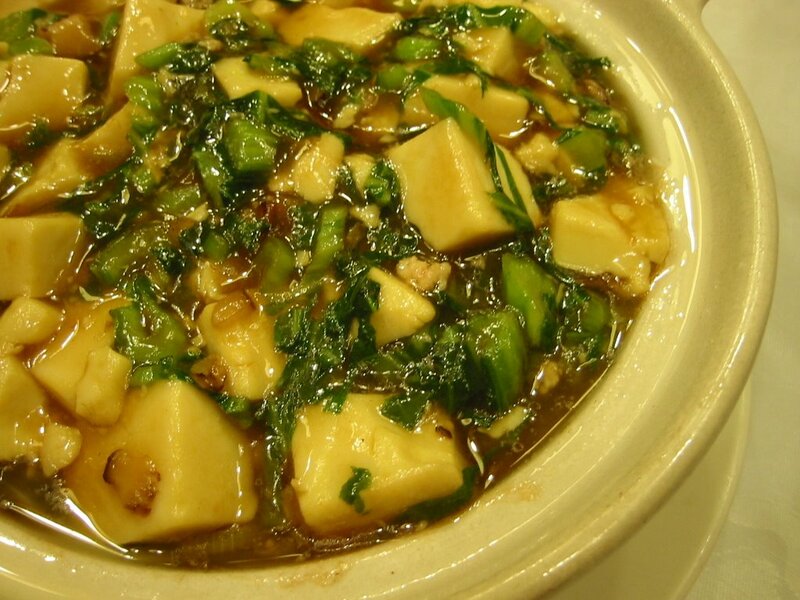 EIther way, I'm glad to have it here in Taipei as an option for easy, friendly, tasty and quick Italian food. Last night, I had a chance to try out to-go Bellini Pasta again. Even though I wanted to order the Bolognese meat sauce again, I decided to try out new things. 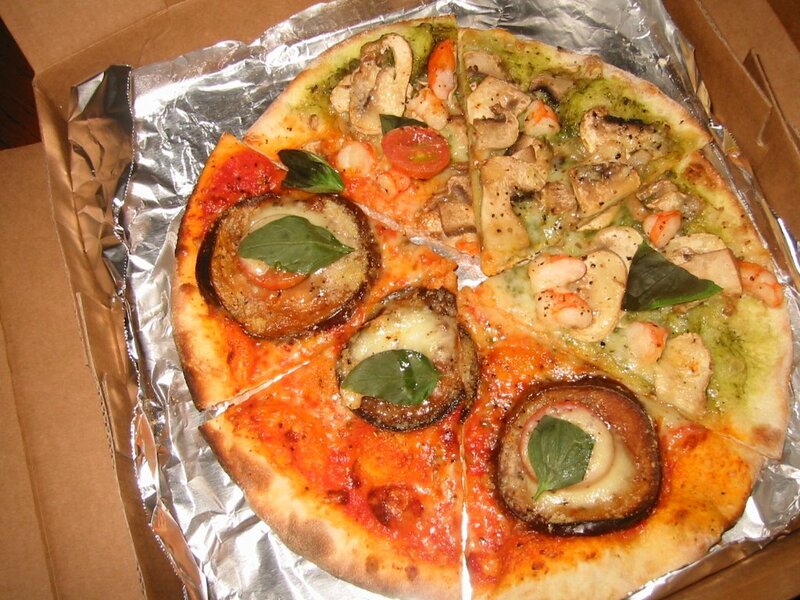 I ordered a vegetarian cream pasta and Pizzetta Half & Half pizza (NT$230) (which includes 1/2 pesto with shrimp and mushroom, and 1/2 red sauce with eggplant and cheese) as well as the Spaghetti with shrimp and mushrooms in basil pesto sauce (NT$460). This was the first time I got a chance to look at the to-go menu which includes antipasto, a couple gratins and risottos and a lot of spaghetti and pizzettas. While Bellini does have one Lasagna dish, all the other pasta dishes are spaghetti- no penne, linguine or fettucine in sight. Because their portions are "family size," they also feature "Pasta Half & Half" - 2 types of pastas and sauces for the equivalent of a 1 dish size/price at NT$480 such as the spaghetti in tomato sauce w/ pork cutlet & spaghetti with yuzu mentaiko, calamari and snow peas. Sounds interesting right? Unfortunately, tonight I found my pastas to be rather bland. 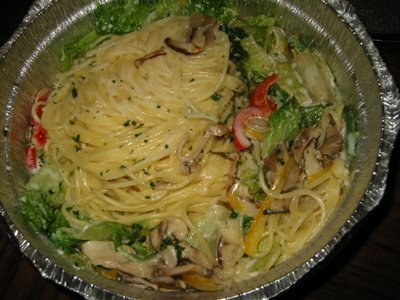 The cream sauce was barely there and the sparse combination of mushrooms, bell peppers and romaine lettuce was not really drool-worthy. The pesto pasta that I had been looking forward to was also in need of some salt or garlic or ground pine nuts or fresh olive oil. Something to make it more aromatic than the slightly creamy, heavy looking and tasting pesto spaghetti we got. It had me missing the pesto pasta I had awhile back at Guy's Cafe or the bolgonese pasta I had a few weeks ago. The pizzette fared a little better, although the red sauce again was stronger in flavor than the pesto slices. The pizzette was smaller than I expected and being cold when I got home to eat it probably didn't help it either. While I think I would still go back to Bellini Pasta Pasta for the unique Spaghetti in meat sauce and soft-boiled eggs, I don't think I will get anything else but the red sauce based spaghettis if I decided to try the Milanese style chicken or the pork cutlet. They are still friendly and quick, but for more flavor, you'd probably have better options with the similarly priced Macaroni Grill nearby or Cosi O Cosi which also features pasta on the lighter side, but with a fresher, home-style spin. 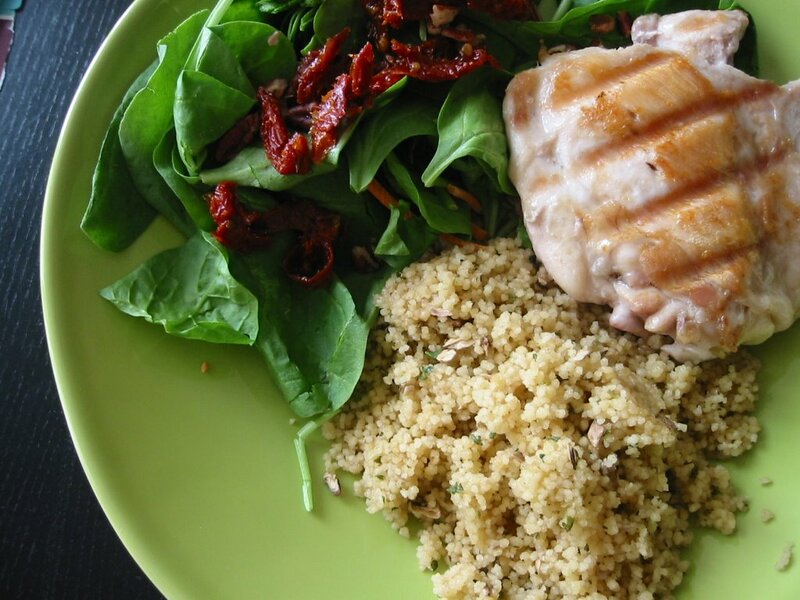 I am always drooling over food- whether it's meals made by a TV chef or a photo on a food blog- I think it's true that you eat with your eyes first. So from the minute I saw a picture of the "Fried rock lobster glazed in caramel with Japanese mountain pepper" in the Weekend section of Taiwan News last week (Sept 22, 2006) and the accompanying article about the "zen-like" beautifully presented and delicious Kaiseki set course, I started daydreaming about eating there. It was also perfect for this month's Dine and Dish, LIKE A VIRGIN, where I would be trying new things all around- a new restaurant and my first food blog event ever, hosted by the Delicious Life, which happens to be one of the very first food blogs I've ever read and started me into a spiral of must-read list of daily drool-worthy blogs. Imagining the morsels of LOBSTER! glazed in CARAMEL! doing a happy dance on my tastebuds kept a smile on my face all the way to the restaurant when I finally made my way there. I called in for a same day with a reservation for 5, and was actually even able to get a private room in the left side of the restaurant once we were there since it was on a slower weeknight. The entrance on the right included a giant wall size fishtank lit an unnatural shade of bright blue and the decor is elegant modern Japanese, even with rock gardens and mini-fountains on the way to the restrooms. 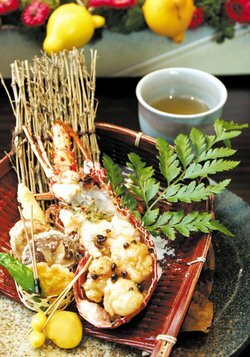 We sat down with the menus and I started to get nervous.. there were a few set courses on the menu, but the Kaiseki course (NT$3000 ~ US$100) reviewed in the paper had a Tempura Red Snapper instead of Rock Lobster. Even the slightly more expensive Chef's set menu (~NT$3300) didn't have it. A million thoughts raced through my mind- (1) They changed the set menu already (2) I only read the article a week ago! (3) Maybe they ran out of rock lobster? (4) Maybe if we ask really nicely they'll make it for us? 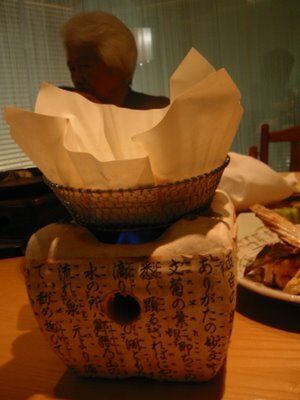 (5) Maybe it's on a even more special menu onesheet that the waitress forgot to give us? 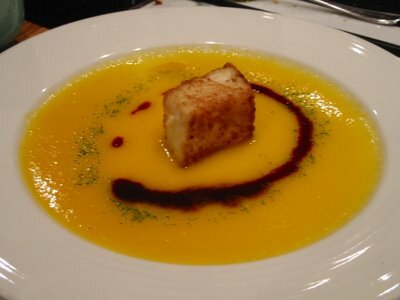 (6) Maybe the chef changes the menu everyday?? (7) Why the heck did the paper focus on the rock lobster if it wasn't even going to be here!!! 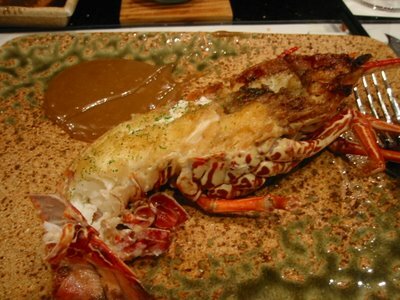 We asked the waitress about it and after some back and forth with her and the kitchen, she said that the only thing was the lobster in the Autumn menu (pointing to a placard on the table) but the shell was fried, but not the lobster. If I could do it again, I would have said, okay, let's order that, maybe it's the same thing. But in the moment, I pictured morsels of rock lobster tempura and didn't want something that wasn't what I drooled over. Now that I have the photo in front of me, I think that was what it was and I'm super sad that I didn't get it. Instead, I ended up making my own quasi-set course by ordering things that appealed to me off the menu to share with the table, and there were quite a few things. 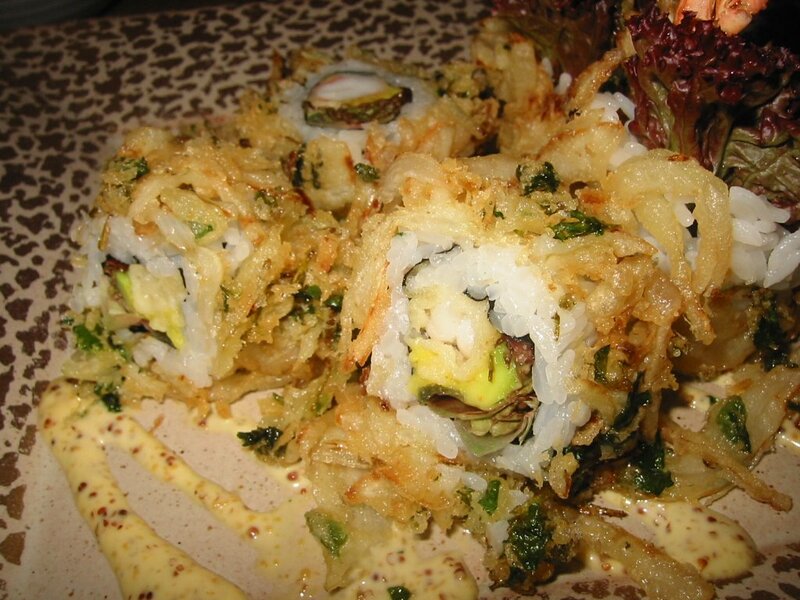 Pecan and Soy Paper Crusted Fried Oysters, Mushroom and Asaparagus Salad, Dragon Roll (Tempura Prawn and Avocado), Eel and avocado, fish chin, and Mushroom soup. I will say that the pictures don't capture the food and ambiance with justice, as it was very dark so I had to use my flash and when I didn't, it's harder to see with the diim lighting. The mushroom soup: I thought it was an interesting twist to serve mushroom soup from a tea kettle. 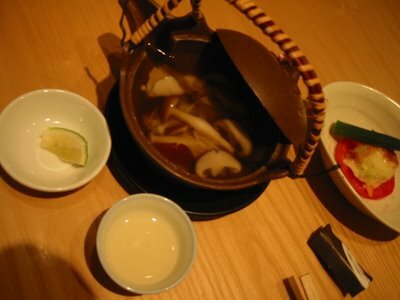 You pour the broth into the two tea cups and drink, and then can scoop out the mushrooms to eat afterwards if you want. The broth was flavorful and deep, but the mushrooms had all the flavor sucked out of them. Two other people in the party said that they thought it was salty, but I didn't think it was. 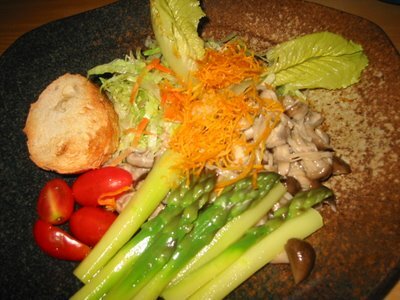 The asparagus mushroom salad: I wished the tangy, sweet dressing that came on the mini-bed of lettuce was on the rest of the salad, since the mushrooms and asapargus tasted sort of plain in comparison. 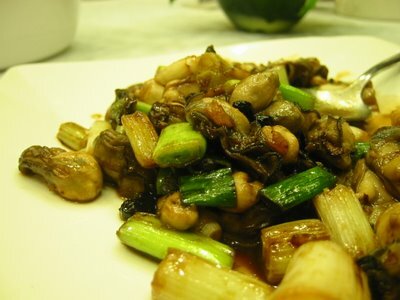 Even as a mushroom lover, I felt tasted a bit slimy. I also didn't know what to do with the accompanying piece of bread- it was stale and hard as a rock. I don't know what the orange crunchy shreds on top were, but they gave the salad an overall nice bite. The pecan crusted oysters: These were a lot more dense than I expected, although I guess I should have expected the slivers of pecans to make the deep fried dish a lot heavier. 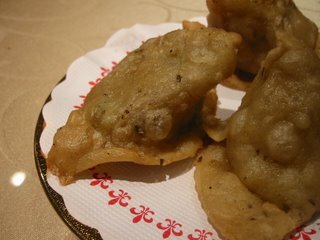 I like my deep fried oysters big, like these were and I haven't had them in awhile, so I was excited. The pecan and soy paper add an interesting texture to the soft body of the oyster, they gave each person a tonkatsu dipping sauce that was not bad. the Rolls: Both rolls were okay, although, the avocado was barely noticeable in both. 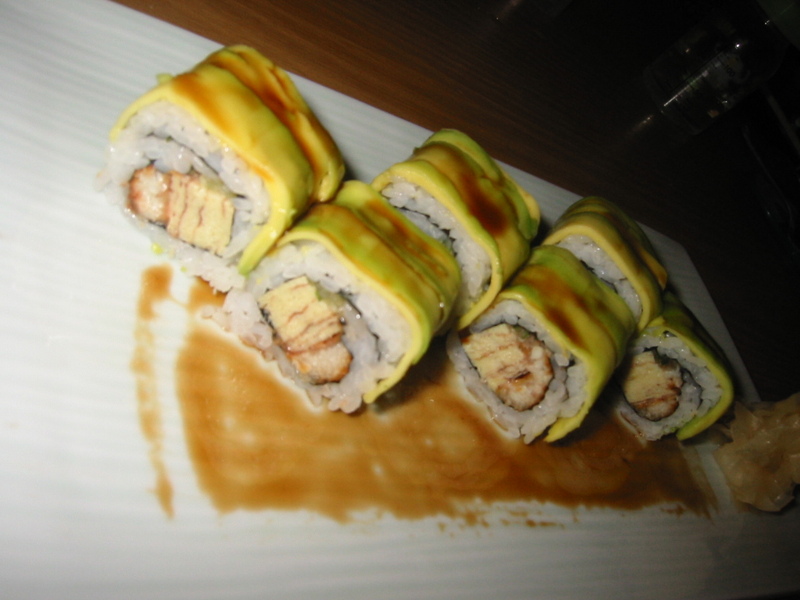 I was also very surprised to see the prawn/avocado roll was entirely fried, rather than just the prawns. 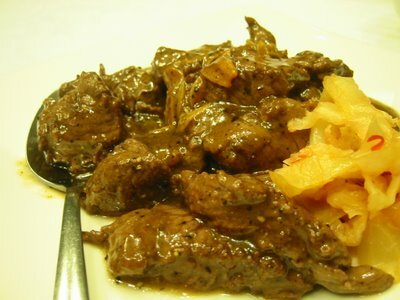 Not only deep fried, but with onions- again, it made the dinner a lot heavier/greasier than I was expecting. 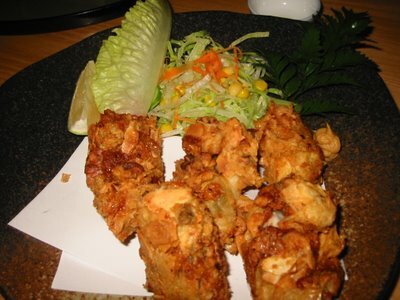 Several people ordered the set menu- a tempura set menu, the beef set menu and a vegetarian set menu. Here are a couple glimpses of what I saw. I also didn't take a picture of the fish chin- though it was a lot of meat, I found it slightly fishier than I would like and not as crispy. 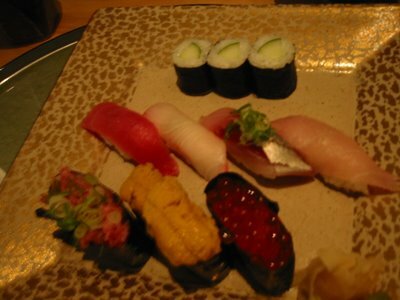 My overall impressions- it's definitely an upscale restaurant with upscale prices to match, but I think that you can get just as good food for half the price at other upscale Japanese restaurants such as Sumie. Like any relationship, I think I end up comparing all my experiences to your first- which in my case is Sumie, which has various set courses, but one at NT$1500 is mouthwatering and filling and so beautifully presented. I wasn't blown away by the food that I had at Suntory, and maybe it's because I didn't order the chef's special set menu, but I don't think that you should have to order the most expensive thing on the menu to be blown away. I liked it better than the often stuffy Peony Japanese restaurant, but I didn't get what I hoped for when I read the review in the paper. Sometimes the fantasy is better than the reality, but you don't know until you try it. I was expecting shaved ice, but I got a soupy mix of toppings instead- it might have been because the tapioca balls were warm and melted the ice, or maybe it was a warm day, or maybe that's how you were supposed to eat it. For NT$45, you can choose up to four toppings, hot or cold, and add condensed milk for an extra NT$10. Today, I chose tapioca balls (their specialty), red bean, mini-mochi balls, and taro mochi balls. There is an array of other things you can choose from such as almond tofu, lemon jelly, peanuts, green beans, big red beans, taro, among other things. In a 2003 review, Taipei Fun says,"No preservatives, artificial flavorings or colorings are used in their products. 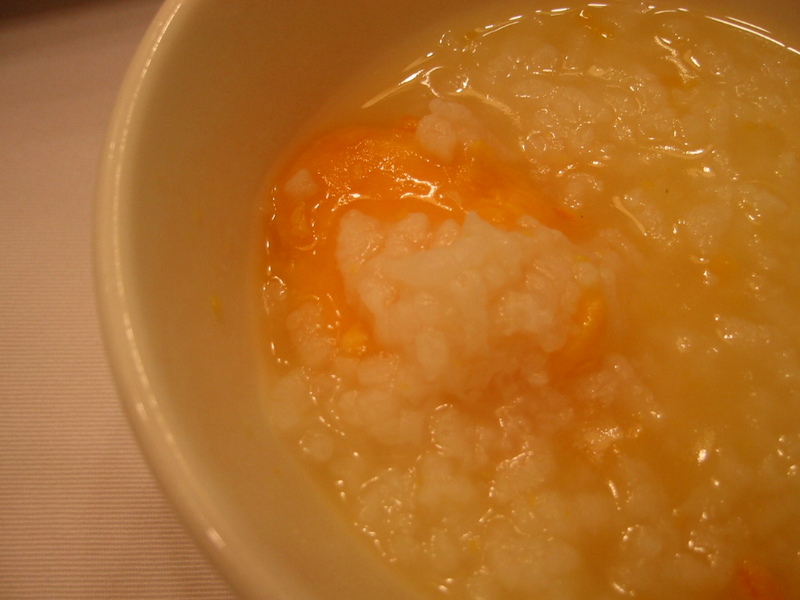 Consistency has customers coming in continuous succession for a taste of the round tapioca pearls. " Like a lot of local places, there are no signs in English and most likely no one that speaks English, so you just point and pay and move aside. Hopefully you know what the toppings are that you want! Some people like to stir their shaved ice until it becomes a soupy mess. If you do, you should try it out. So, actually, I didn't really care for what I ended up getting. 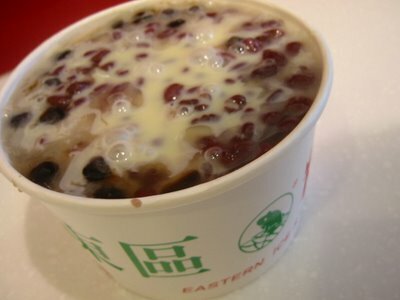 I prefer to have the condensed milk ontop of the shaved ice, but instead it just made the sweet toppings here too sweet. A busy location with ample seating next door, it seems to be fairly popular, but not too crowded that you weren't able to find a seat on a Saturday afternoon. 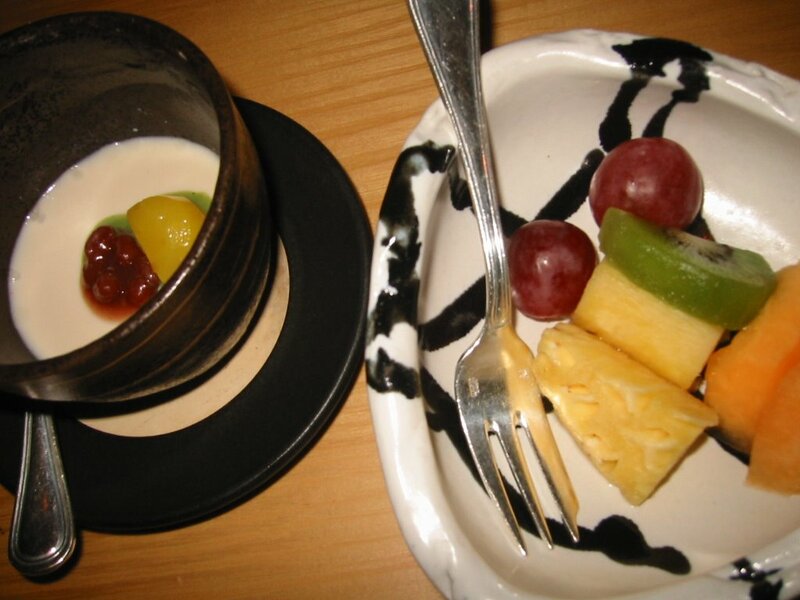 For a local dessert fix, next time I'll stick to the shaved ice, or get some soy tofu from Little South Gate. If you are looking for Taiwanese specialty dishes, but don't want to sit in a crowded stall in a night market- Shin Yeh is your best bet. You know that a place is good when it's packed with locals- it's like when you are in the states, you want to eat at the Chinese restaurants that's filled with Chinese people, not non-Chinese people. But not that tourists aren't welcome- the menu is very tourist friendly with both English and Chinese and lots of pictures of each dish. Located on the busy Chung Hsiao shopping area, it's fairly easy to find. Once upstairs, it's a fairly nice sit down restaurant with a few private rooms. STRIKE THREE: Another disappointment this day- the Naan! 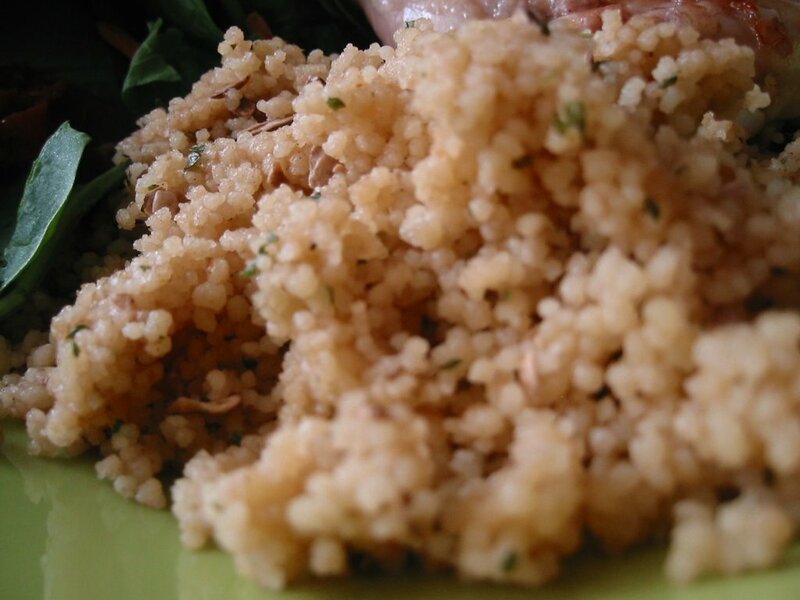 It was dense and heavy, like pita bread rather than fluffy crispy naan I've come to love. Did I order wrong, I thought to myself? I asked for original flavor in chinese, but this was not like the Naan I had before. I even compared it to the picture from the last visit. As the servers were busy attending to other customers and we were ready to leave, I didn't bring it up to the waiters. 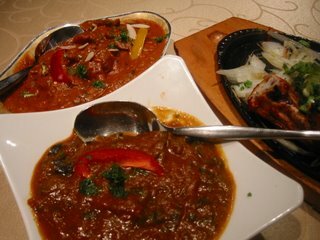 The Mutton Korma and potato side we ordered were still very good. 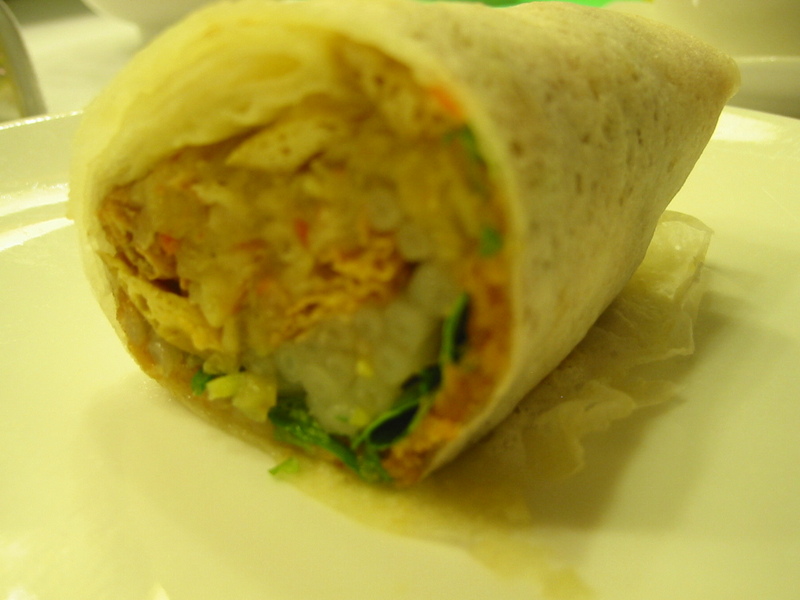 The rice was a good accompaniment, though more like sticky rice than basmati rice, maybe to accomodate to the Taiwanese tastes. As I heard other customers order the lunch special set (which I didn't know about since I didn't see it on the menu and the server didn't mention it), I was a little curious- but it definitely on the light side with one meat dish and rice, naan, soup, fruit, drink (though I heard there are different levels of lunch sets). Our lunch for two ran about NT$1210 (with service fee), as my friend also ordered soup and a strawberry lassi. I will have to try the other Indian restaurants before returning to AALEJA to compare, but for now I'm revising my "strongly recommend" to a neutral recommend because of their three strikes today. I really enjoy Indian food, and I think that I've had some of the best Indian food in Asia- Singapore, Hong Kong and now Taipei. 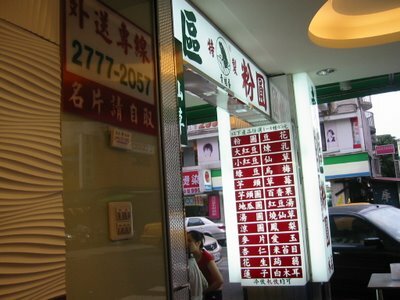 There are actually quite a few Indian restaurants in Taipei to choose from, but sometimes that becomes more confusing- which one is "authentic" and which ones cater too much to the Taiwanese tastebuds? 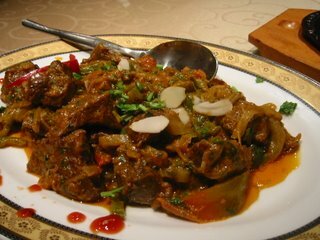 On this occassion, I was actually searching most of the day to choose one Indian restaurant for a group family excursion and set with the near impossible task of finding one that might have a private room- as they do in many Chinese restaurants. Calls placed to Tandoor, Ali Baba and New Delhi asking if they had a private room resulted in varied interesting responses (one "no" and then hang up, one confused no and one polite no.) After scouring various internet boards, quite a few TaiwanHo! forum posters recommend Aaleja. To my surprise, they actually had a private room available (and were friendlier than some of the other restaurants on the phone I had called)! 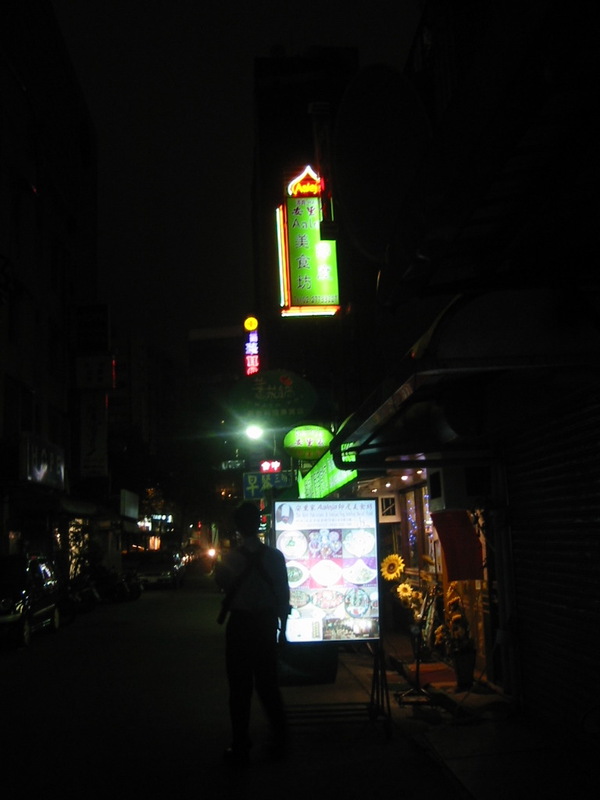 After a few twists and turns, you will find the entrance, which at night is light by a neon sign and a large lit entrance collage of food photos. The dinner was great. We got an assortment of curries: the mutton karahi (NT$410), chicken vindaloo (NT$300), beef korma (NT$310), the eggplant masala (NT$190), as well as the chicken tandoori (full chicken NT$550), samosas (3 for NT$160) and naan (NT$50)/ garlic naan (NT$70). We also got a rice dish (which I can't remember the name) and to my surprise it was curried instead of plain basmati rice. Each of the curries were had distinct and complimenting flavors to another, and the meats were stewed to tenderness . 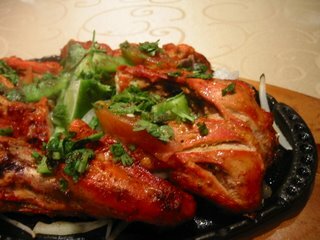 Our full order of chicken tandoori was split into two hot plates. 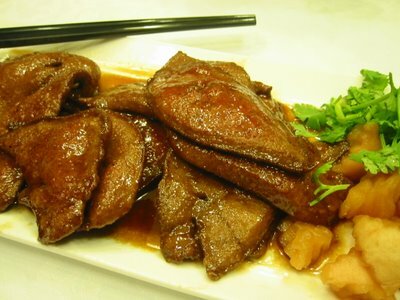 The chicken was tender and flavorful. 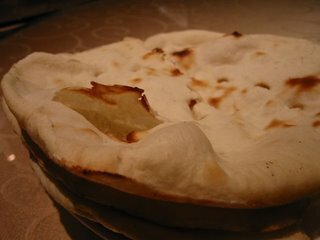 The naan was soft and crispy. The samosas was the only disappointment because the skins were slightly soggy and not crispy. Our table of seven people finished everything! The private room had very cool mural along one side of the wall and a tv in the other corner that played Bollywood films, perhaps to help transport you to India. The restaurant area was crowded and boisterous. The service was friendly and accomodating. The food took a little while to be served, but once the food came, it all came fairly quickly. I'd like to return to try their weekend brunch buffet, mmmmm. I think you have to be a member or know one to eat at the Taipei City Club. 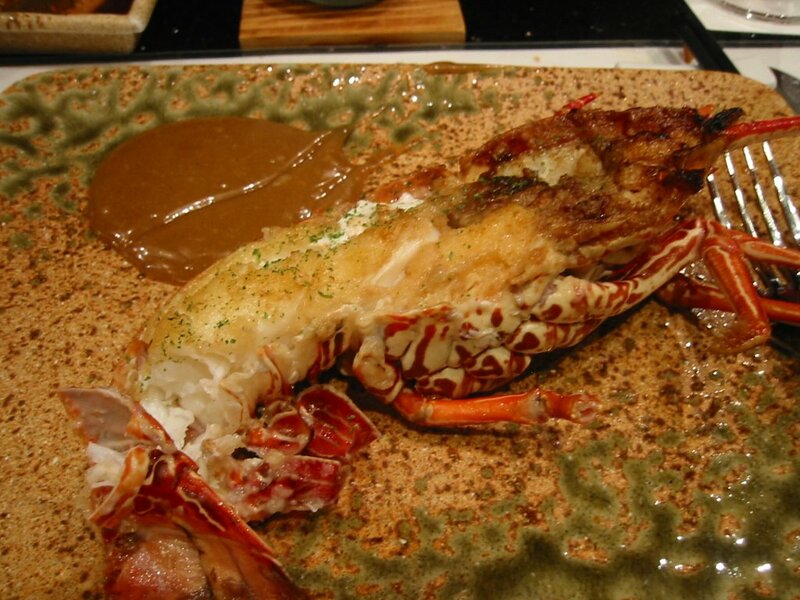 Luckily, we had a chance to eat at their Teppanyaki restaurant which features a multi-course meal with your choice of lobster or other seafood. While most people are familiar with teppanyaki-style of dining as popularized by the American food chain Benihana's- these chefs don't do tricks, but it's still fun to watch them cook. 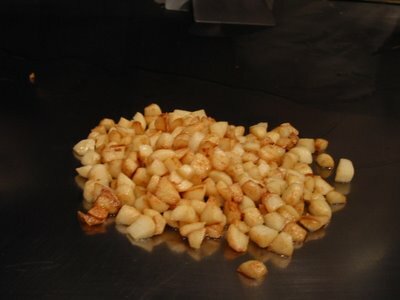 Personally, I always find it fascinating how they keep the cooking surface so spotless. 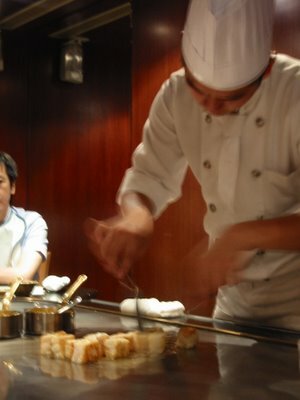 and the lobster cooked right in front of you (so that I could yell "no cheese" before he melted a slice onto mine). 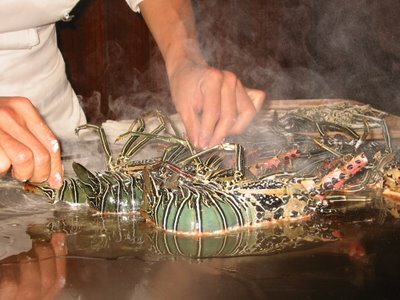 It's sort of weird to see the lobster wriggling in front of it while it cooks, but I try not to think about it too much. I'm just happy that I get to eat my whole half-lobster rather than it being diced into pieces and divided amongst the group when you can't be exactly sure it's being divided exactly evenly! When you are eating lobster, it does matter! My friend who loves garlic ate this whole pile. Their portions are not huge for the prices you are paying and the pace is leisurely, but it's a special treat for occassions like anniversaries and such. 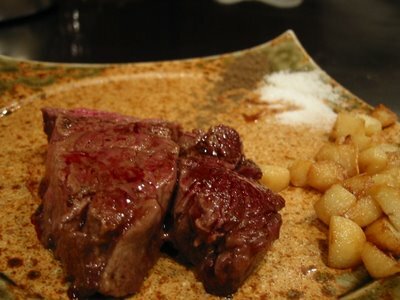 Most teppanyaki places I've been to have multi-course meals with smaller portions. I don't know if they didn't have it, or we just didn't order it- but it would have been nice to have some steamed mushrooms or spinach or bok choy vegetables to go with the dinner. If you want to eat a lot for less, you're better off eating all-you-can-eat bbq where you can grill your own food. 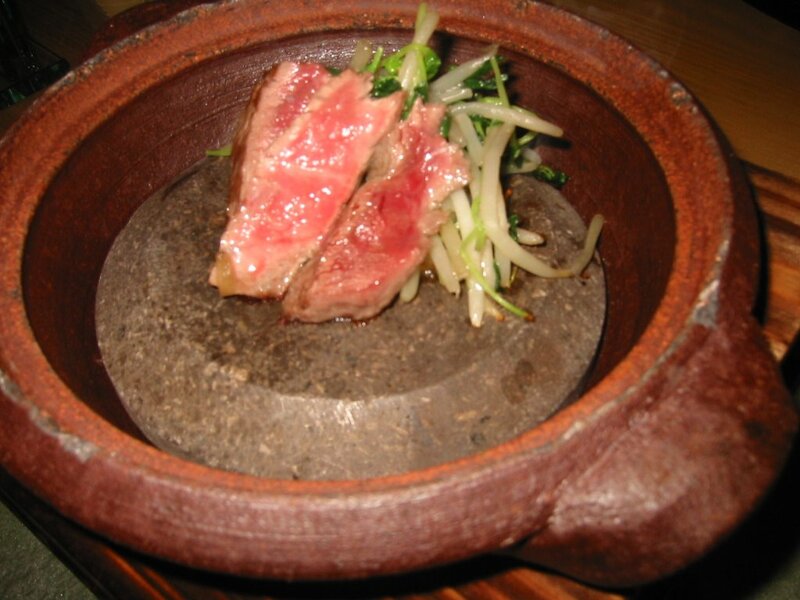 But the higher quality steak and seafood can be found here.